One year after breaking ground for a brewery, Tantrum Brewing of Cleveland, Georgia, is realizing a dream. The family-owned business is the brainchild of Ross Crumpton, who like other beer-loving men, got into beer-making during college. Years later, he returned to his hometown, joined forces with other family members and began the process of opening a craft brewery. Unique among Georgia brewers—and most craft beer companies in general—Tantrum was awarded a designation for Agri-tourism because the family grows the hops used in the beer production on its own farm. Last year the family planted 300 hops plants, with five different varieties suitable for the types of beer they plan to create. When you visit the brewery, you can see the hops plants in the adjoining fields. Can’t get much closer than that to the source of your beer! Tours of the hops yards will be available from May to August. 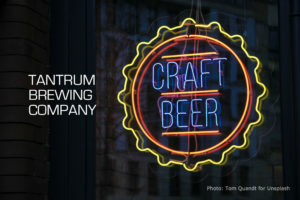 The first beer Tantrum Brewing introduced was a Berliner Weisse-style sour ale, just one of a lineup of new brews. Keep tabs on this company as it develops even more interesting pours. Better yet, stop by the Tap Room any Thursday through Sunday and do a little tasting. Thursday, 4:00 p.m. – 8:00 p.m.
Friday, 4:00 p.m. – 9:00 p.m.
Saturday, 1:00 p.m. – 9:00 p.m.
Sipping beer and watching the sun set over the mountains is one of the leisurely pleasures of staying at Lucille’s Mountaintop Inn & Spa. Book a stay and discover all the other joys of a getaway here! Book online, or call us at 866-245-4777 to make your reservation. This entry was posted in Breweries, Food and Drink, Georgia Bed and Breakfast, Georgia Mountain town and tagged Craft beer, Georgia Bed and Breakfast, Georgia Mountains, North Georgia B&B, North Georgia Mountains by admin. Bookmark the permalink.